"Wildlife art is all about passion but also patience..."
Renowned for capturing the true essence and spirit of her subjects in amazingly detailed and realistic works of art, Morgane’s passion & fascination for the natural wonders mingle with her acrylic pigments and every brushstroke invites you to travel through animal kingdom. As a self-taught artist, Morgane has perfected her talent by studying the technique of hyperrealism masters such as Robert Bateman, Carl Brenders or Terry Isaac. The approach is both technical and naturalist with an intensive work of observation, research and reference gathering on the subjects and their environment as an intimate knowledge is key to faithfully portray the creatures’ grace, agility and nobility. 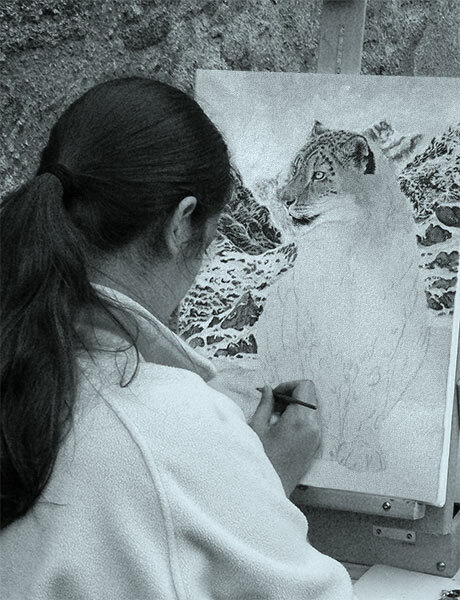 Some pieces take up to several months to complete, wildlife art is all about passion but also patience. Morgane’s art has won numerous international prizes and awards, her work can be found in private collections across North America and Europe and she offers custom portraits and commissions. She also supports ongoing wildlife conservation efforts by helping to raise funds and to educate people with her work. From a graphic point of view, wild animals are a wonderful challenge for any artist: with their incredible diversity of habitats, shapes, colors, textures and behaviors they are fascinating subjects of study. But beyond the artistic appeal, when you know that many species are threatened and on the brink of extinction, painting and showing them becomes a necessity, a duty to raise awareness, educate the public and support conservation efforts.